David, our fantastic Director here at Foot Trails and creator of many wondrous trails, visited Stonehenge this week. 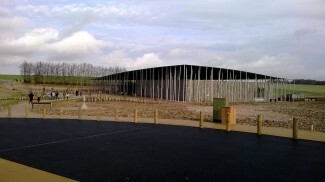 The new visitor centre has opened. So what did he think? Here is his verdict and low down, in his own words…. I love Stonehenge. I love everything it represents and tells us of our ancestors – hope, ambition, spirit, imagination & ingenuity. But for years the experience of visiting the stones has been flawed. Cut off from the landscape by roads and disconnected from the artefacts that have been found here it has always been hard to imagine what the circle meant and the people that built it. So it was with trepidation that I visited the new centre that has been built to welcome visitors from around the world and to help explain the story. Would this be the transformation that has been discussed and argued about for decades? The new visitor centre building is architecturally striking, the tour coaches that arrive by their 10’s every hour are well screened away from the building. There are ticket booths and you now transfer to a ‘land train’ to take you just over 1½ miles to the stone circle. It does make it feel a little like a bus station, a transport hub, marooned in a field. But excitingly there is a new exhibition that attempts to bring to life the story. A projected 360o video gives you the opportunity for you to stand inside the circle and through different periods in its life, including the ruin it is today. There are some of the artefacts that have been found here on display and also plans to keep changing the exhibition to tell different parts of the Stonehenge story. I always sit on the fence with ‘interactive’ history and reconstruction. It has its place but if you go too far somehow it can make the ‘real’ seem, well… seem less inspiring. The real Stonehenge has been a ruin for 1000’s of years. I decided to shun the land train and set off on foot to visit the stones. Walking the landscape I picked up the old processional route that our ancestors would have followed to the stones. For me the most exciting part of the changes would come next, the stones in the landscape, emerging as they did for our ancestors, and no main road cutting them off! Was that a tinge of ley line power I felt? Sadly the A303 is still there, without doubt if we had the imagination to get on and sink the road and connect the circle to the rest its landscape then we would be giving this ancient place the respect it deserves. The new experience is much improved but it is still flawed, it is designed to process visitors through as they arrive in there 1000’s every day. I’m not sure there was any alternative with it being so popular a place to visit and I’m glad to hear that ticket numbers per hour are to be restricted. My plea? Make sure that local people and local business have the opportunity to be a part of the stones future, don’t let Stonehenge become just part of a day trip on the coach from London. Restrict the coach tours and work with local people to bring visitors here sustainably and authentically.